Jonah is such a contemporary figure that he could walk out of one of our churches. Jonah reminds us that the chief characteristic of redeemed people is not that they never sin but that they are ready to repent of their sin when they are reminded of God's grace. The prophet Micah lived several generations later than Jonah. God called Jonah to cry out to the wicked idolaters in Nineveh but he called Micah to cry out against the wicked sinners of Jerusalem. Jonah wrestled against God's gospel message for pagan unbelievers, yet Micah was broken-hearted in his fervent desire for Jerusalem to repent and believe. If Jonah connects us to our mission to the world, Micah informs our challenges with today's Church. 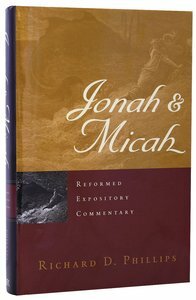 About "Jonah & Micah (Reformed Expository Commentary Series)"
Jonah is a figure of such contemporary features that he could walk out of one of our churches. Moreover, Jonah reminds us that the chief characteristic of redeemed people is not that they never sin, for sadly we still do, but that they are ready to repent of their sin when reminded of God's grace. The prophet Micah lived several generations later than Jonah. Whereas God called Jonah to cry out to the wicked idolaters in Nineveh, he called Micah to cry out against the wicked sinners of Jerusalem. Unlike the earlier prophet, who wrestled against God's gospel message for pagan unbelievers, Micah was brokenhearted in his fervent desire for Jerusalem to repent and believe.